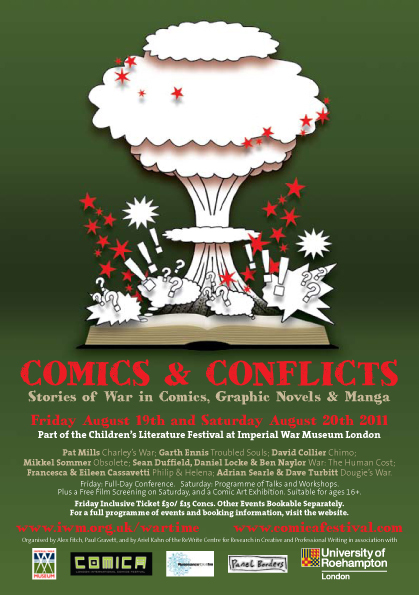 Description: A recording from the 2011 Comics and Conflicts conference at the Imperial War Museum, London. Grant Rogers talks to Pat Mills about Charley’s War. MP3 direct download link here (right-click and ‘Save target as…’). More information and alternative download formats here. Description: In two talks recorded in August and January 2011, we explore the work of female comic book publishers and their work in the medium. In a Q and A recorded at the Imperial War Museum, Alex Fitch talks to Eileen and Francesca Cassavetti, about Eileen’s wartime diary Philip and Helena which Francesca republished recently in comic book format plus in a talk recorded at Laydeez Do Comics, Corinne Pearlman discusses her work for the Jewish Quarterly, her publishing endeavours with Myriad Editions and her design and editorial work for Comic Company, which produces healthcare information in comic strip format. Description: Continuing our month of shows about war comics, in a panel discussion recorded at last month’s Comics and Conflicts conference at the Imperial War Museum, London, Paul Gravett talks to Mikkel Sommer about his graphic novella Obsolete, to publisher Adrian Searle and artist Dave Turbitt about Dougie’s War and to film maker David Blandy and illustrator Inko about their project Child of the Atom. Edited and introduced by Alex Fitch. Description: Continuing our month of shows about war comics, Panel Borders is pleased to present a selection of interviews recorded at the launch of “Draw your Weapons – the art of Commando comics”, a new exhibition at the National Army Museum in Chelsea, as Alex Fitch talks to curator Robert Fleming, current Commando editor Calum Laird, and former editor George Low about the history of the comic and the art on display at the museum. Also in another recording taken from last month’s ‘Comics and conflicts’ festival at the Imperial War Museum, Roger Sabin and Martin Baker give a presentation about the depiction of the Iraq war and PTSD in the US comic strip Doonesbury. Description: Starting a month of shows about war comics, Alex Fitch talks to award winning writer Garth Ennis about his interest in the genre, from the backdrop of conflict in his debut strip Troubled Souls to his exploration of wars throughout the 20th Century and beyond in his series War Stories and Battlefields. Alex and Garth also discuss his past and forthcoming projects for Avatar, Dynamite and Marvel Comics and there are questions from the audience on the subjects of putting his stories into context for younger readers and the use of drones on the battlefield. This interview was recorded live at the Imperial War Museum, London as part of the ‘Comics and Conflicts Festival’, August 2011. Description: In an episode of Panel Borders previously broadcast as a live ‘Clear Spot’ on Resonance FM, Alex Fitch talks to Paul Gravett, Ariel Kahn, Eileen Cassavetti, Francesca Cassavetti and David Blandy about about the importance of war comics in culture and bringing the experience of war and conflict to new readers in a way that text alone can’t fully realise, plus the forthcoming Comics and Conflicts conference and events at the Imperial War Museum. Paul and Ariel discuss classic war comics and Francesca and Eileen talk about publishing the latter’s war time diary in comic book format, plus, in excerpts from a couple of classic episodes, Alex talks to Garth Ennis, and Grant Rogers interviews Pat Mills about Charley’s War. Description: Continuing our month of shows about War Comics, we’re proud to broadcast a final panel discussion recorded at the ‘Comics and conflicts’ conference at the Imperial War Museum, August 2011. Alex Fitch chairs a discussion on ‘The personal and the political’ as the publisher and two of the contributing artists – Sean Duffield, Daniel Locke and Ben Naylor – talk about their anthology War: The Human Cost. They are also joined on stage by writer Eileen Cassavetti and cartoonist Francesca Cassavetti who published her mother’s wartime journal Philip and Helena in comic book format. All podcasts appear on Comics Forum courtesy of Alex Fitch of Panel Borders.